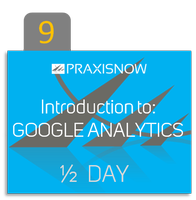 THE GOOGLE ANALYTICS COURSE WITH AN EDGE! Anyone responsible for observing, understanding, reacting to and developing strategies based on what is happening on their websites. This introductory Google Analytics course is suitable for non-technical as well as technical personnel across all organisational functions who need to track and report on website performance across all digital channels. This single morning Google Analytics course is a small-group (from 1 to 8 people) interactive workshop featuring live demonstrations of Google Analytics in action and is supported with highy interactive discussion on various analytics strategies and ideas. Depending on what figures you look at, Google Analytics is being used used today by somewhere between 45% and 70% of the website population. It singular use exceeds the combined total of all other website analytics solutions put together. That makes Google Analytics perhaps the single most important “thing” in digital marketing that you need to get your head around! Despite the enormous amounts of data it processes, understanding Google analytics is not difficult. It is a solution for business, aimed at business users, but providing the additional tools needed for more technically-minded personnel to product the type of reports that agile businesses need to thrive in the modern world. This Google Analytics course – with an edge, uses live demonstrations to teach you how to set up and configure it, what the possibilities are, things to look for, how to achieve certain views of your data and what kind of decisions can be made based on the data presented. In a nutshell – don’t miss it!